Day 1 of #40dayvegetarian went pretty smoothly. Here’s what I ate. Breakfast Avocado Egg Toast – I eat this almost every day. A piece of very dry whole grain toast (I use the Seven Grain from Wegman’s) with half a mashed up avocado topped with an over easy or poached egg. You can spice it up with salt and pepper, red chile flakes, or a squeeze of lemon juice. It’s soooo good. And full of protein! Lunch My daughter and I attended Ash Wednesday services at a local church and walked to her favorite soda fountain/lunch counter nearby. I had half an egg salad on wheat with lettuce. And a cherry Coke! We don’t drink soda, but they mix theirs with cherry syrup and crushed ice, so it’s a special treat. Dinner Since I was eating alone I had some leftovers. Cheese grits topped with sautéed Swiss chard with leeks and a balsamic vinegar reduction (both left from Sunday dinner). I topped it with a poached egg for protein since I ran this afternoon, and had two small pieces of this wonderful Billy Bread that I get from Richmond. Other stuff While you don’t need the nitty gritty of everything I ate (I didn’t go on a bacon bender or anything) I had an orange after I ran and for dessert I had a piece of Texas Sheet Cake that I made on Monday. That’s it for me! 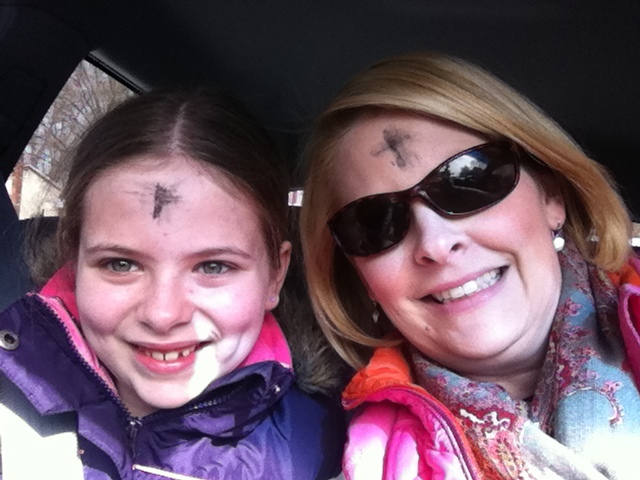 How did you do with your first day of Lenten commitment? Did anyone else go to Ash Wednesday services? Here’s a recipe for a similar Swiss chard if you want to give it a try!